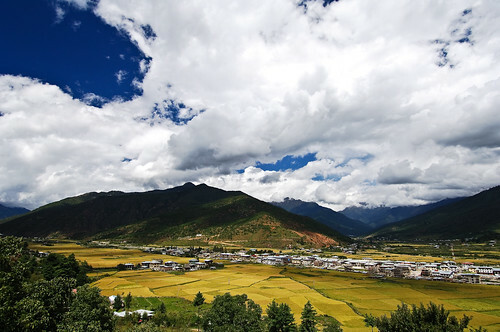 Paro is a wide and beautiful valley, lush and green with rice grown abundantly. Owing to the fertile valley, farmers in Paro are comparatively better off than the farmers elsewhere. Double story Bhutanese farm houses richly painted is a common scene in Paro. Paro is also home to about 650 monasteries, temples and monuments but none is as dramatic as the 8th century Taktsang, or “Tiger’s Nest” temple. A highly revered temple built on a sheer cliff face at a height of 2,950m, the site is widely visible from the valley floor. 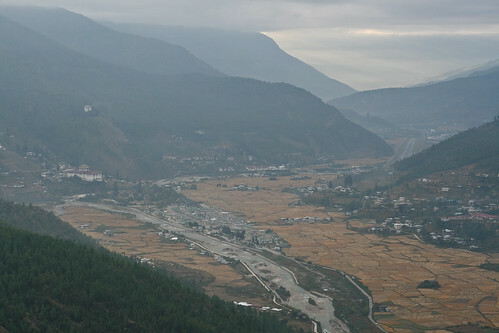 At an altitude of 2,250 m., Paro is a beautiful lush valley, and a popular travel destination in Bhutan. 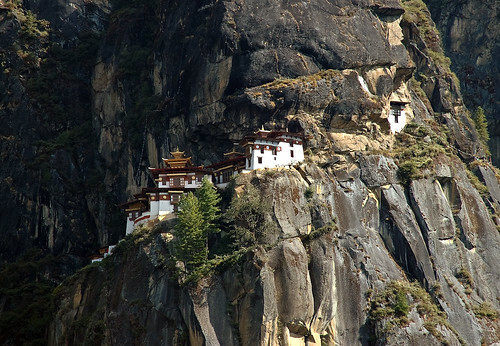 Taktsang “the Tiger’s Nest temple”, is one of the holiest temples in the Buddhist world. The only international airport in Bhutan is in Paro. 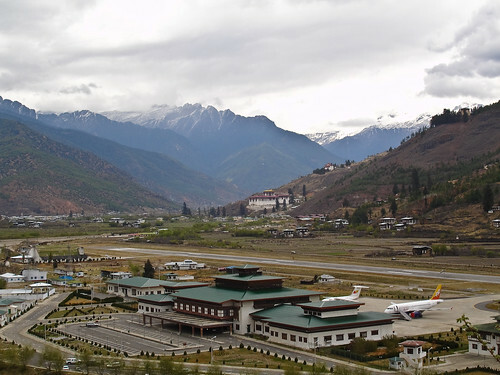 The Paro International Airport is the home of Druk Air – Royal Bhutan Airlines. Druk Air is the only airline that fly to Bhutan from other countries. There are direct Druk Air flights to Bangkok, New Delhi, Kolkata and Kathmandu. Because of the airport, most visitors would be spending 2 nights in Paro; one on arrival, and another on departure. Paro International Airport, the only airport in Bhutan. Downtown Paro has seen a major boom in the last few years. What used to be just a single street of traditional 2-story Bhutanese houses, has mushroomed into a small town in its own rights. Discos, bars, and snooker rooms jostle for attention with the many handicrafts shops and restaurants. If your guide is willing, it could be quite an experience for a night out in downtown Paro. Downtown Paro, with the Paro Dzong in the background. In the olden day before the Chinese took over Tibet, there was a thriving trade between Bhutan and Tibet. One of the main trade route was from Paro. Even today, Chinese goods like thermos flasks and mobile phones make it to the shops in downtown Paro. The popular Chomolhari Trek follows this ancient trail for a while. For 2 days the popular Chomolhari Trek follows the old trade route to Tibet.